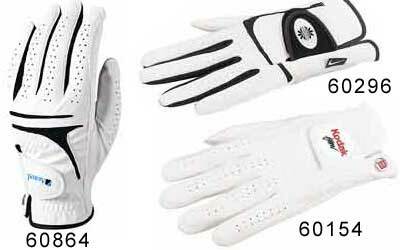 Nike(R) Custom Crested Tech Feel Golf Glove provides great feel, grip and durability. Pre-curved finger design improves fit and prevents bunching around knuckles. Synthetic leather with Lycra material Note: please specify right or left; small, medium, large, or extra-large; men's or women's . Get a good grip with the Wilson(R) Select Crest Golf Glove. Scotchgard(R) leather protection repels water. Scotch-gard (TM) cabretta leather Note: please specify right or left; small, medium, large, or extra-large; men's or women's . Embroidery also available - call for pricing.